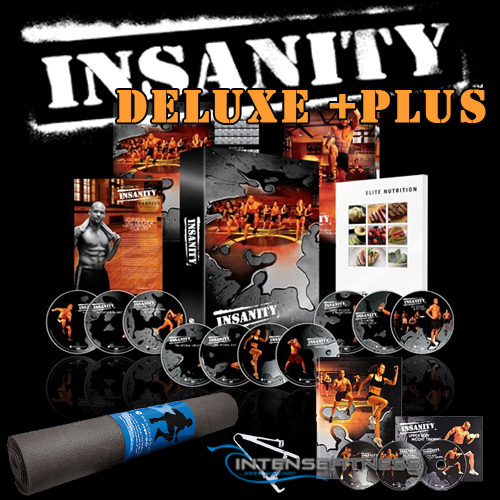 The Insanity Deluxe +Plus home workout program ships with everything you’ll need to transform your body (and your life) in 60 days! Order now and get the new Fast and Furious bonus Insanity workout DVD, a $19.99 retail value. BeachBody has provided Intense Fitness with a limited supply of this bonus Insanity DVD. We are giving them away with each order of the Insanity Deluxe +Plus workout. Are You Ready For Insanity Deluxe +Plus? Ready for the challenge? Ready to loose fat while at the same time building strength, power and resistance by using plyometric drills and interval training. This DVD is all about cardio, no intervals, just insane nonstop cardio. This DVD is the transition from your first 30 days to the next 30 days. This DVD takes interval circuit training to a new level and is more intense than any workout to this point in the program! 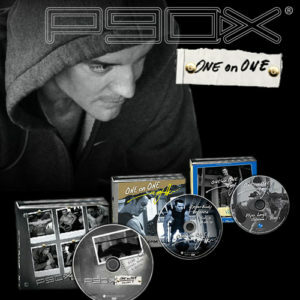 This DVD takes interval pylo training to a new level as you go all out! This DVD is all out cardio and cardio abs, pushing you to your limits! Get high impact results without high impact injuries, this professional grade Jump Mat is essential to getting through intense plyometrics workouts like the ones in INSANITY. Your body will thank you for this super shock absorbent mat that protects your knees, back, and ankles. No home gym should be without it! Monitor your fat burning progress and stay motivated with this simple, essential tracking tool. A food plan designed specifically to complement the intense workouts Insanity puts your body through to fuel your body and maximize results. Just the basics here, this guide is intended to give you just the information you need and keep you working out instead of reading. This calendar complements the Insanity workout by organizing month 1 and month 2 in such a way that you can track your progress and stay motivated. The fitness test tracker is designed to track your workout results and show you how much your fitness improves from week to week. The Insanity workout is the creation and brain child of elite personal fitness trainer Shaun T. and has been dubbed in many circles as the “the hardest workout put on DVD”…not to worry, that’s what pause, rewind and slow-motion are for! The Insanity workout is so effect due to the combination of maximum interval training, plyometrics, with aerobic and anaerobic routines all preformed at your max. What is maximum (max) interval training? Max interval training is the key behind the Insanity program. The term max interval training is a derivative of an industry standard known as high-intensity interval training (HIIT), the difference being that with the Insanity workout, you’re not working at “high intensity”, your working at “max intensity”! Traditional high intensity training is working at a high intensity for short periods with longer rest times. The insanity workout reverses this with longer max intensity periods and shorter rest times. The intervals with the Insanity workout are longer and the rest periods are shorter! Max interval training is intended to improve performance and burn fat with very short, but intense training sessions, rather then the normal cardio workouts that can last for an hour or two. This type of interval training when done at high intensity is favorable for burning fat and improved muscle strength. Plyometrics, also known as “plyos”, is an exercise training system that is focused on producing fast, powerful movements in which a muscle is loaded and then contracted in rapid sequence. Plyometric movements can be found throughout the Insanity workout, which help to tighten and strengthen muscles while burning calories and reducing fat. Is The Insanity Workout Right For Me? There’s no doubt that the Insanity workout is one of the toughest (if not the toughest) home fitness workouts available on the market. That being said, you can workout at your own pace, one that you’re comfortable with, right in your own home! Since Insanity’s inception, lots of people with different goals and body types have benefited from this intense 60 day workout program. The Insanity workout is right for anyone who has made a commitment to better themselves and are willing to stick with it for 60 days.